A man who envisaged the modern world of computing was an engineer who had studied psychology – J.C.R. Licklider (1915-1990). He had lectured for some time at Harvard. He envisaged a symbiotic relationship between humans and computers. He visualized time-sharing automated computers, assisting humans in decision-making, and initiated the idea of transforming the mainframe into a personal desktop that empowers individuals, promotes creativity and allows the sharing of information all over the world. Building on the idea of an automated library system outlined by Vannevar Bush, he wrote a series of memos on a globally interconnected set of computers, which would enable everyone access data and programmes from any computer site. In 1962, Licklider moved over to develop the Defence Advanced Research Projects Agency (DARPA). He convinced his successors of the importance of the networking concept and packet switching as a better means of interconnecting computers. In July 1964, Leonard Kleinrock of MIT brought out the first paper on packet switching. Two years later, he persuaded his colleague, Larry Roberts to work for DARPA, whose Director, Robert Taylor, hired to develop computer network. Roberts published a plan (1967), outlining what became known as ARPANET. Taylor outlined his vision of the Internet with remarkable foresight. “The Internet”, he said, “was not about technology; it’s about communication. Internet connects people who have shared interests, ideas and needs, regardless of geography”. His paper raised quite a few eyebrows in disbelief but convinced a few who mattered! In 1969, when the world was glued to the first man on the Moon, the first-ever link between computers was tested on Earth without fanfare. Inspired by Engelbart’s demonstration a year earlier, a research team led by Leonard Kleinrock connected the first host computer to the first switch called an interface message processor. The first attempt to set up the ARPANET was successful. In October 1969, the node at the University of California, Los Angles sent packets of data to a node in the laboratory of Engelbart at the Standfrod Research Institute, some 500km away. This is considered to be the very fist piece of hardware of the future Internet. ARPANET, which went live, was commissioned for research on networking. It emerged not as means of withstanding any nuclear attack as was commonly portrayed, but simply as a means to access remote computers serving research facilities across the country. The first message read, ‘Trying to spell log in’ but the system crashed after the first two letters viz. L and O were transmitted! But it is considered the world’s first Internet transmission, though some say that it occurred only eight years later in 1977. Undaunted, researchers installed the third and the fourth nodes a t the University of California, Santa Barbara and at the University of Utah. When man walked on the Moon for the first time, four computers were connected to one another on the ground! The floodlights of the media focused on the moon landing mission in 1969 eclipsing another critical invention announced in the same year. It was known as charge-coupled device or CCD, which transformed patterns of light into information. It was destined to play to key role later in digital cameras, high-definition TV and other devices. Worldwide access to data required an efficient transmission network. An innovative technique, called packet switching was proposed on both sides of the Atlantic. The technique, developed for telecommunications, involved sending a message in the digital form as separate electronic bits across the transmission media to be re-assembled at the destination. This deceptively simply technique marked a truly historic innovation in telecommunication and eventually in the development of the Internet. The theory provided the basis for calculating the maximum capacity for any communication system to transmit error-free signals. Packet switching turned out to be a seminal factor in shaping networks into the modern Internet. The technique was based on an information theory proposed in 1948 by Claude Shannon (1961-2001), an outstanding thinker and researcher at Bell Labs. A student of the illustrious Vannevar Bush, Shannon became a professor at MIT. A year after the transistor was invented, Shannon proved that electrical circuits could be used to perform logic operations. It was an extraordinary insight which eventually redefined the digital age. His theory provided the foundation for the digital communication revolution. Soon, integrated circuits provided the hardware to realise his theory. His Mathematical Theory of Communication is considered one of the greatest intellectual achievements of the 20th century. It led to an age when man, the food gatherer, began to gather and nurture information part of daily life. Shannon defined a ‘bit’ as a unit for measuring information. He gave formulas for the information flow rate of source as well as the capacity of a channel, measured in bits per second. The idea was useful when engineers in the USA and England independently developed packet switching for sending electronic message. Paul Baran (1927-2011), another Internet pioneer who worked with the RAND Corporation, invented the technology in the United States (1960). He and Donald Davies of UK (who coined the term ‘packet switching’) independently proposed the technique, which paved the way for the Internet. Multiple voice channels in telephone switching could be carried as digital transmission. The basic rationale for packet switching was explained in terms of national security. Packet switching was described as a distributed network, which could survive a nuclear attack unlike a centralized one, which can easily be destroyed. Another pioneer who contributed to basic ideas on packet switching is Louis Pouzin of France. In the 1970s, he defined how data should be labeled to reach the right destination. He was a focal point for cooperation between Europe and America. Meanwhile, silicon chips were used in computer memory applications followed by floppy disks. The first microprocessor, Intel 4004, was introduced in 1971. The enormous impact of these developments unfolded over the next decade. Some observers have traced the origin of e-mail to MITs Compatible Time Sharing System, known as Mailbox, but it was stored on a single computer. In 1961, Tom Van Vleck (MIT) developed a technique of commands to send a message to other users and became one of the authors of the first e-mail program. However, the commands did not leave the machine and go across a network. By 1965 it was available in some of the mainframe computers though without any storage or memory. One could just send messages to various users of the same computer E-mail was put on the ARPANET in 1972. The basic programme, written by Ray Tomlinson, a computer scientist in Cambridge (USA), was made public. Tomlinson is honored in the Internet Hall of Fame. The man who bluntly declared that the term ‘information’ is meaningless raised quite a few eyebrows. 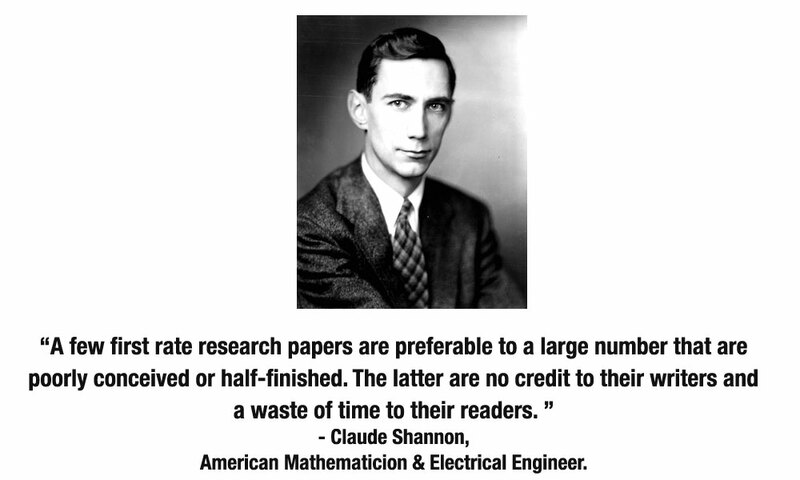 He was Claude Shannon, farther of the Electronic Communication Age. His ironical statement marks a revolution. As James Gleick, science writer observes, Shannon’s information theory removed any inherent meaning from the term, information, which can stand for anything viz. a letter, a sound bite or a video segment. The implications of this rather simple fact changed the face of communications and provided the basis of the infrastructure of the emerging Internet. Shannon famously treated information as a measurable physical quantity like density or mass which is in a quantitative form, a yes/no format, known as binary digits or bits. A bit is a unit of storage and all of information can be converted into electronic bits, transmitter and regenerated in the order planned. That is one way of understanding his theory. Shannon applied George Boole’s algebra to the problem of electrical switching. Transmission of bits allowed for data compression (or deletion of redundancy) and provision for error detection and correction. He gave formulas for the information rate of source and for the capacity of a channel, each measured in bits per second. He showed how reliable communication can be had, despite noisy channels. Claude Shannon’s 1948 paper was titled, ‘A Mathematical Theory of Communication’ and not a ‘Mathematical Theory of Information’, meaning that it does not matter for communication whether information is devoid of meaning. Shannon’s theory had great practical value. It formed the basis of digital communication. It became relevant to an age of the integrated circuit, artificial intelligence and genomics. Shannon joined Bell Labs in 1941 and worked on the problem of most efficient transmission of information. He had a doctorate in Electrical Engineering and Mathematics from MIT. Earlier he graduated from Michigan University. He left Bell Labs in 1956 and became professor at MIT. Shortly after propounding his theory in 1908, he built the first machine that played chess. He had a child-like fascination for juggling models. In his toy room he had built three clowns, which juggled eleven rings, seven balls and five clubs, driven by an invisible mechanism of clockwork and rods.